Looking back, I’m not entirely sure when I became interested, but interested I certainly became, in buses; not any old buses though, but those of the Western Welsh Omnibus Company. Certainly, by the age of ten I was considered by my peers to be an authority on the subject knowing every little detail of the various designs of each of the models. Many were very similar at first glance but I could easily identify all of the models which frequented the largest depot of the company which was at Bridgend, my home town. When I was in the last year of junior school my grandmother thought it would be a lovely idea to take me on a coach tour. I was enthusiastic about this, naturally, and must have talked non-stop about spending the day on a coach. Gran had other ideas though and decided to start small and booked an afternoon mystery tour. I was a little disappointed in this as I knew the afternoon tours used the older coaches of the fleet and I really wanted a ride in one of the more modern ones. However, it was booked, and we arrived at the bus station early hoping to grab the front seats on the coach. Sitting in the coach bay was, sure enough, one of the older coaches but looking very smart. 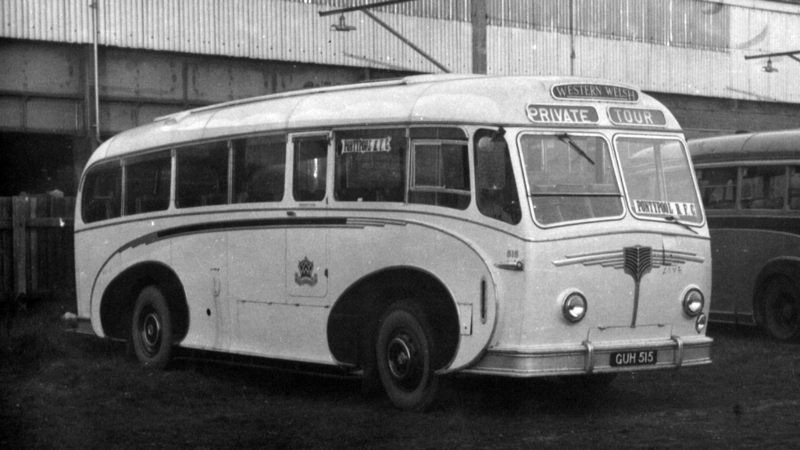 It was one of the Willowbrook-bodied 39-seat centre-door models built in 1953, in the GUH registration series (like the one shown in the photograph). Unfortunately we couldn’t get the front seat, that was bagged by a talkative eccentric lady with long flowing hair that we both knew, so we chose the seats just behind the driver instead. I have no recollection of where the coach took us, but I recall I really enjoyed our trip. A year or so later, when I was in the early years of secondary school, I suggested to my grandmother that we should go on another tour, their “Welsh Wonderland” sounded ideal and I had seen the coaches they used on these tours and I wanted a ride. They usually used a 1958 AEC Reliance with Harrington Wayfarer IV coachwork in the OUH registration number series. These were very smart looking coaches and in my eyes very modern even though by the time I went on this tour they were four years old. The trip was arranged and my grandmother had been early enough in booking to reserve the two front seats which was an added bonus. 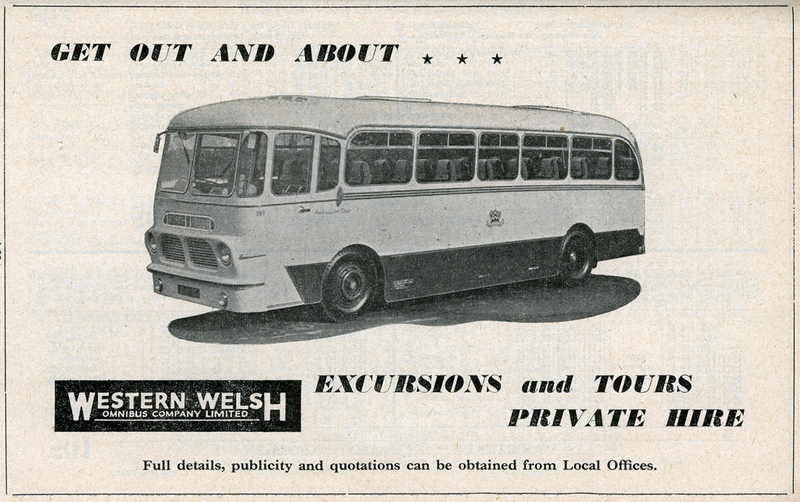 The Wayfarer featured a lot in the 1958 timetable book published by Western Welsh and shown here is one of the advertisements. On arrival at the bus station, there was one of the Wayfarers parked in the coach bay, we boarded and sat in the front row. I chose to sit, not by the window, but in the aisle seat where I could get a better view of the driver as well. That was quite a good move as we also had a co-driver who stood in the step-well for much of the time describing the journey we were taking and blocking some of my grandmother’s view of the road ahead. I have no idea which route we took, but we ended up at Builth Wells where we all had to vacate the coach for an hour or so while the drivers had lunch. Gran and I sat on a bench by the river eating our sandwiches until the time came to re-board. The journey home commenced well enough but before long the coach started to cough; this continued for a while and then it seemed to settle down. Somewhere near the village of Erwood when ascending a steep hill the coach engine suddenly died, no amount of coaxing from the drivers could get it restarted so one of them walked back to the village to a telephone box to call an engineer. It took ages for the mechanic to arrive on the scene and he pronounced it dead! Another coach was summoned from the Brecon depot and I wondered exactly what they would have available which was suitable for tour work. When the replacement eventually arrived I was really disappointed to see it was an ordinary service bus. It was one of the MKG registered 41 seat Willowbrook dual purpose Tiger Cubs that had been new in 1956. When new they had been very smart but as the years went by they looked shabby very quickly; we had a few in Bridgend and I didn’t like them, they were ugly and their semi high-back dual-purpose seats were not comfortable. Gran and I boarded the bus and set off for home arriving well after the hour we were supposed to return. We never did go on another coach tour! My Dad was a bus driver for Western Welsh in the late 60’s & 70’s. I used to love getting up early with him and travelling with him on the LLantwit Major run first thing on a Saturday morning. He’d often take me into work with him and I have many happy memories of visiting the depot. I was always fascinated by his ticket machine (This wasn’t long after they introduced driver/conductor only buses). It looked so complicated and important. His mates in the depot used to let me push the chalk barrow around and sprinkle the chalk on the diesel spills in the yard. I thought it was the best job in the world, and decided then, it’s what I wanted to do when I left school. I remember once putting an old sixpence into the ‘One armed bandit’, in the staff cafeteria (I can still remember the smell of the Lino and wax polish they used on the floors), and won the £5.00 jackpot. I bought a microscope with my winnings from Watts’ toyshop, which I still have and shall pass it on to my grandson when he’s old enough. Every year Western Welsh would put on a kids Christmas party, and my uncle Ray, a rather rotund fellow, would always dress up as Santa. In the summer we’d go on the Western Welsh ‘Mystery Tour’, and I can remember the excitement of having to guess where we’d end up. I recall one year we actually went on a train journey, and another ‘Uncle’ named Idris, won £15, for correctly guessing Margate as our destination. It was during our visit that I met my first ‘Hells Angels’. I was mesmerised by their motor bikes, but laugh now at the memory of my mother frantically dragging me off a beautiful 500cc Triumph. One of the gang had seen my admiration and kindly sat me on his machine. My dad passed away in 1977, a very young man of 38, but reading you site has brought back many happy memories. I really enjoyed reading about the old depot. Thanks for the reply Randell, it’s good to know my memories reach out and stir other’s own thoughts from the past! 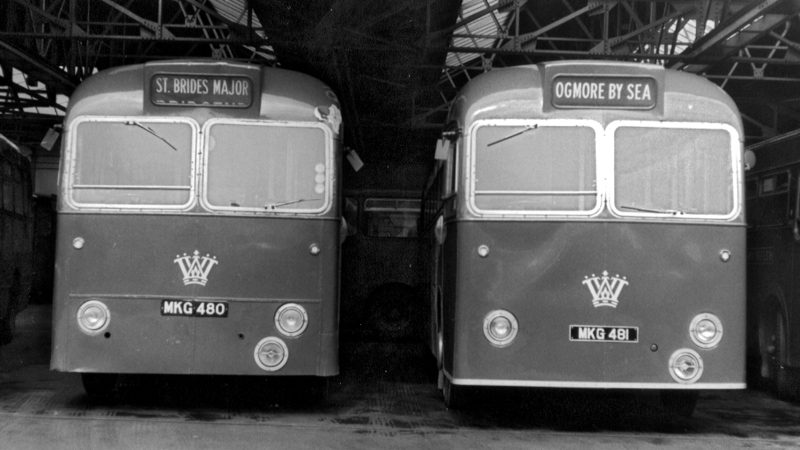 I too remember boarding tour coaches from Porthcawl pier in about ’58-61 before Porthcawl Omnibus grew into the market and also took over our local service from regular WW JBO 74. I also remember my first Atlantean trip, queuing in the peak at Bridgend as various buses called to reduce it and being amazed when this decker presented itself! I later joined the Grammar School which gave me the opportunity to become a similar expert amongst my peers. Happy to share more memories if you’re keen.